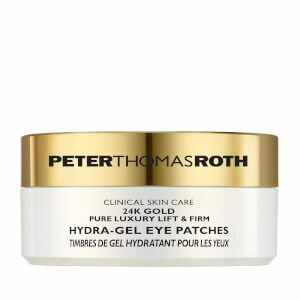 Transform skin with the Peter Thomas Roth Gold Hydra Gel Eye Mask; a luxurious anti-ageing treatment harnessing the power of pure 24K Gold and Colloidal Gold to leave the delicate eye area positively glowing. 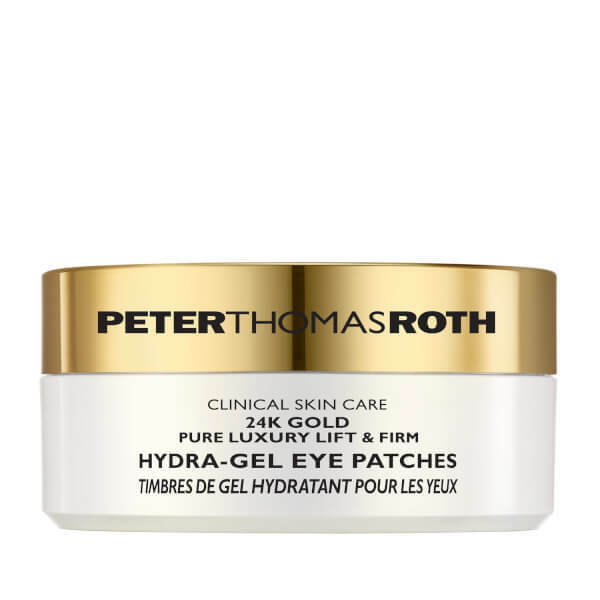 Working to impart moisture and improve firmness, the refreshing eye patches infuse skin with nutrients and humectants, delivering a dramatic plumping and lifting effect. Dark circles and fine lines are visibly reduced while Caffeine and Hydrolyzed Collagen help alleviate puffiness and leave you looking more awake and revitalized with skin that feels smooth and supple. Use enclosed spatula to gently lift and separate a delicate gel patch. Apply onto clean, dry under eye area. Repeat on other side. Relax and enjoy for 10-15 minutes. Discard after use and gently pat remaining serum into skin.